Engine: B & W 6 cylinder oil engine built by J.G. Kincaid & Co. Ltd. 4,500 bhp 12 knots. November 1962: Completed by Lithgows, Port Glasgow for Lyle Shipping Co Ltd, Glasgow. Time chartered to British Iron & Steel Co. Ltd. (BISCO) for 15 years. 1969:	18th January, stood by MV Firth Fisher 17.5 miles off Bishops Rock. 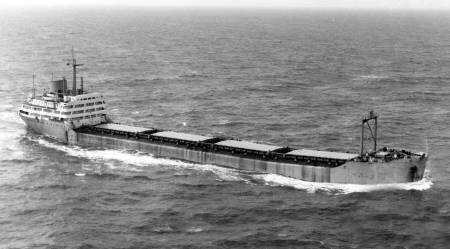 Firth Fisher had developed a list of 15 degrees after her cargo had shifted. 1971: January, on voyage Port Cartier to Immingham with iron ore, hit by an abnormally fierce following sea which caused considerable damage. The vessel diverted to Southampton for emergency repairs. 1978:	Sold, Albion Maritime Inc., Monrovia, Liberia (Gulf Shipping Lines Ltd., London) Singapore flag. Gulf East Ship Management Ltd. Singapore, managers, Renamed AL TAWWAB. 1984:January 28th. Left Osaka, Japan for Beilun, Zhejiang, China to be broken up. Arrived February 5th.